Here I want to test its limits and say something about who this course is not for. It seems to create strong emotion for or against, as I found out in my research for this post. For example, Guy Cowley a fellow OU student tells us that ‘ Anyone worrying that the US will covertly take over the HE world via MOOCs can be re-assured by watching the intro video by Jim Groom. The toe-curling ‘we are just a tech-savvy in-crowd having FUN’ would not seem remotely relevant to education in cultures taught through conventional didactic pedagogies. They might think they had tuned to Friends by mistake!’ (Cowley, 2013) I assume that from this world-view the Friends comparison is meant to be derogatory but may be not. The rest of his review takes a fairly swift and mechanistic approach to describing the course and concludes that with a philosophy to ‘be cool! [where] hating Elluminate [is] symptomatic of the establishment-denying ethos’ and without a clear ‘business model’ its success may be short-lived. Interestingly, even though the tone of the review is fairly negative it concludes that ‘the course is a phenomenon; there would seem no lack of commercial interests who would like to target this high energy, poster-child group.’ There is no further exploration as to a rationale for this conclusion, but it seems clear that Guy was not smitten by his initial contact with the DS106 experience unlike some others who believe that DS106 ‘is the world’s most powerful course – a gale-force of 106-mph so intense it literally knocks socks off your feet’. Somewhere in the middle of these two extremes lies a critique of a course that is suitable for some and unsuitable for others. A balanced account of DS106 as compared to Udacity has been written by Hendricks (2013). In what follows I will assume familiarity with the DS106 format at least to the level explored in Hendricks’ post. The rest of this post attempts to give a balanced overview of its nature and limitations. I will also address the claim that it is a cult and how I came to become the DS106 Headless Shrink. DS106 is always experimenting with its format and execution; it is ‘of the web’ not ‘on the web’ hence utilises the Internet’s open architecture as much as it can; mostly only people who are already independent learners will have the motivation to engage; it is not replacing the course at the university but running alongside it and enhancing its reach. Although this may foreground the positives it also offers limitations in the background. There are a few familiar distinctions from my work as a psychologist that will help me determine where the limits of DS106 lie. I look at these in the rest of this post and whilst for ease of discussion I set these up as conflicting opposites, I actually understand them as polarities or educational dilemmas which educators always hold in tension. By the nature of our role we are (or should be) expert polarity managers. Or in the words of Carl Gustav Jung ‘ the greater the tension, the greater is the potential. Great energy springs from a correspondingly great tension of opposites’. We simplify at our peril. The collective aspect of DS106 is very striking when you join it. It has its own oral tradition and it is no secret that shared narrative creates group cohesion. As storytelling is the focus of DS106, it is clear that community/collective members understand the importance of a shared oral tradition and they use technology in order to foster it. Should you choose to do DS106 you will soon come across a tapestry of stories that are continually being added to by members; from talking dolls that embody care and empathy, to tough military men who bully you into ‘making art, damn, it’. Then there are the dead bodies, the headless photos, dancing professors and not forgetting the re-invokation of missing people via animated gif creation. Yes, it takes a particular kind of learner to engage with the mythology of DS106 and understand that the learning is in the engagement. There is no linear guide for new members, the stories weave in the interactions of those who ‘get it’. By definition there must be those who try to join in but never ‘get it’ and leave without a trace. What students slowly learn is that the process of interacting is as much part of the digital storytelling to be learnt as working through tutorials in the handbook. There is a richness in this that cannot be put in a box, and what is also true is that there is a great deal of unpredictability in it and the danger of it raising fears about inclusion/exclusion always latent in us humans. DS106 tries to address this by a 2 week ‘bootcamp’ at the start to allow students to develop their digital fluency with the tools they will need. I think that this will help, but will this convince any of my colleagues to attend? The response has been negative so far – I just don’t have the time to set up blogs, learn new tools and what about privacy? If you are thinking about DS106 then you do need to factor in the fact that there is an expectation that you will be fairly fluent in ‘web-speak’ and social media. Even if you are, you will still need to learn many tools and workflows for producing digital stories. DS106 teaches you how to do it all: Audio, video, photography, writing, poetry… I could go on. The tools are myriad as are the potential applications you could learn, and this says nothing about the creative process and the psychology of creativity. I have been teaching and researching creative thinking for many years and whilst I see inspired educational technologists in the DS106 collective, it does seem to me that either you come to it as a creative thinker or you may run away in panic at what you may be asked to produce. if I am honest, even with a high level of digital fluency, creative thinking skills and self-efficacy, I am still in awe of the quality of output I see daily under the #DS106 Daily Create and a little scared to try! The psychology of creativity involves a great deal and as the new self appointed DS106 Headless Shrink I hope to bring some of that capability into the collective. I digress. A simple and fairly old concept in creativity theory is the difference between divergent and convergent thinkers. It is possible to learn divergent thinking skills but some say individual differences exist and we choose our careers and education based on these preferences. As Robinson tells us in the video below – whilst divergent thinking is not synonym with creativity it is a core component of it. It is our ability to push the envelope to see beyond the givens of a situation – a paperclip hold papers but many more uses can be thought for it by those with ease in divergent thinking. The creative process requires both types of thinking at different times but you cannot converge on a solution to a creative endeavour if you cannot first diverge on possibilities. Creativity requires that we suspend disbelief and ask ‘if we could think of a way to x, how would we do x?’ If you are one of those people who is more likely to see obstacles to a solution than possibilities, then you are less likely to thrive in DS106. Those of us who thrive in a world that presupposes possibility – I know it can be done, I just don’t know how yet, or the digital equivalent: I want to do it, there must be an app for that – may find our spiritual digital home in DS106. One of the issues that also becomes relevant here is one’s position on how the vehicle for learning is designed. Terry Winograd talked about how well designed tools are invisible artefacts. When studying learning design recently I learnt (Funes, 2013) about this and other design patterns for developing digital artefacts. DS106 is not designed according to this pattern. The idea behind it is that the tool merges in the background whilst we engage in creative endeavours, it does not get in the way of what we are trying to do. 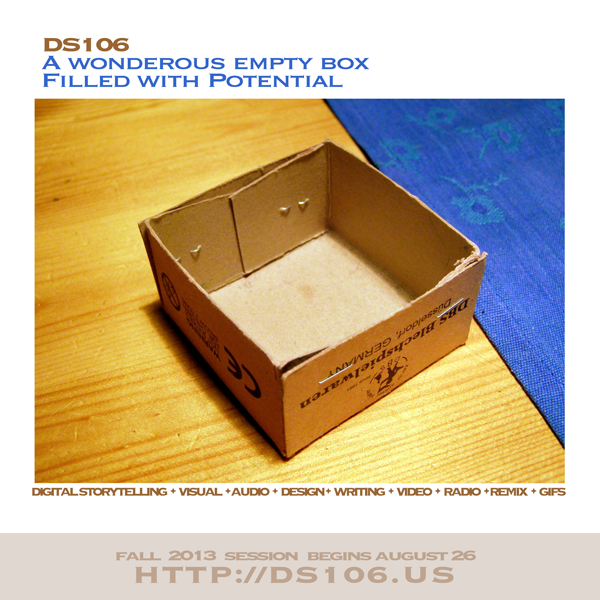 DS106 is intended to teach you about the tools as well as the creative endeavour. It is also fundamentally about choice and proud to offer all the choice the internet has to offer. This means that you have to be willing, nay enthused, about delving backstage at the internet show (Funes, 2013). My recent experience with backstage in a walled garden registration driven LMS was (without exaggeration or irony) a nightmare; trying to do new things with old tools, is just fool hardy. I digress again. DS106 understands that to be ‘of the web’ means open with no walled garden in sight. This does make the backstage experience both more fun and less frustrating. However, there is still a need to delve backstage and there is no hope of invisible tools. The list of tools I need to learn grows daily and I have not even started the course yet. I love learning new tools. I love learning. Yet, the familiar sense of infowhelm is starting. There just is too much to learn and not enough time to learn it. And yes, I know how to manage that and how to be a good digital citizen and my resilience threshold is off the scale. I know about Data aikido (Battaglia, 2013) as a lifetime practice. So here is the trade-off: to do DS106 this fall I have decided to dedicate myself to it almost full time. Invisible tools and walled gardens would enable a more expedient way to learn content, but DS106 is for life and I have heard a narrative in the community about how if something frustrates you, you should just ‘DS106 it’ – advise not coming from psychological theory but very much aligned with it. I have the luxury of being like Dr Oblivion of Swaffham quoted above; I am almost retired, I play Sudoku and live peacefully. Hopefully, without disappearing mysteriously at the end of Headless 13. I do work, but only when I want to and this fall I am DS106ing. The general point to this story is that I am very lucky to be in this position. Most of my clients and colleagues simply ‘do not have enough hours in the day’ or so they believe. Unless, you can make the necessary lifestyle changes to integrate DS106 in your life – you should not do it. You will drown. 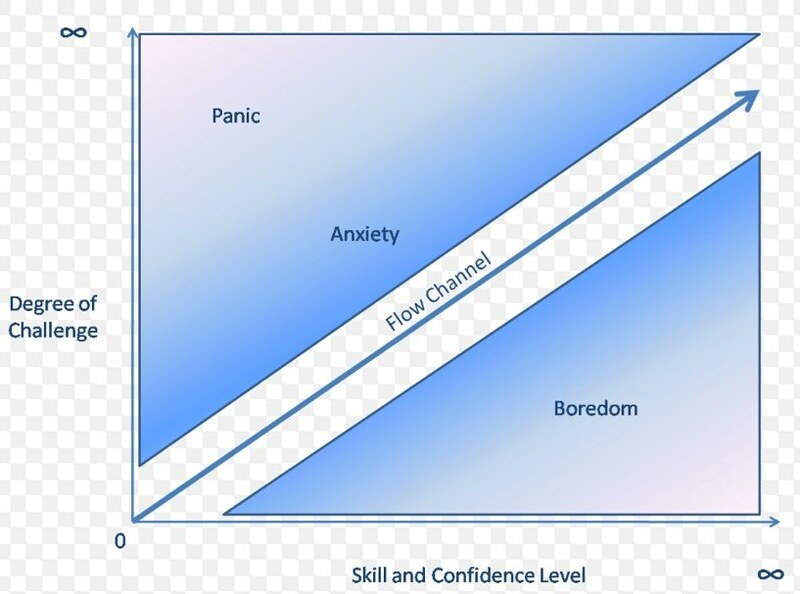 Above I explored polarities that need to be considered from the type of learner/student you might be. Hopefully, I have offered you a sense of the limit of this ‘poster child’ of open education. You need to be honest with yourself about your personal limitations, your stage of development and your life circumstances to decide if you are ready for DS106. Fortunately they now have an excellent in-house psychologist available on Tumblr to have developmental conversations and help you decide if, or how, to participate. Next, I want to explore two aspects about course design and culture. The first is the danger of the Super-professor (Yes, Jim. I am talking about you, of course). MOOCs of all persuasions have been accused of providing a forum for professors with big egos to become rock-stars in their own minds at least. After all, when thousands of students sign up for your course (even if most just disappear a little after registering) it is bound to affect your sense of self in some way (a topic for the DS106 headless shrink to explore this fall, no doubt) and whilst many MOOCs of the x-persuasion are designed as a vehicle to encourage a distorted sense of self, DS106 explicitly sets out to avoid this, with a co-constructivist pedagogy underlying its design. The question is, given that human beings are what they are – herding animals, how well does DS106 manage to avoid blind following of those at the centre of the network? It is clear that DS106 is not intending its students to fit in this category. They are sticking closely to Siemens original recipe and not trying to freeze a product in time or have the course be dependent on its designer. The experiment they are carrying out this fall of running the course headless is an extreme experiment in participant pedagogy ‘There is no “head of the class” in an online learning environment, not even the illusion of one. Students must, instead, construct their own strategies, without a recipe, in the moment. And they should even be called upon to help map the terrain in which that can happen.’ Hence the course is the ‘Headless 13’ run of DS106. There are those in the centre who are most influential, informally if not formally, and what determines how you get to the centre is a meritocracy model of legitimate participation – wether ‘you make art, damn it!’ A meritocracy may be more desirable than the use of positional power, but a hierarchy exists nevertheless. For example, a current assignment in preparation for Headless 13 has Jim Groom dancing all over the world. The intention is to have fun and to show it is okay to mock the professor whilst learning to make animated gifs. But are there some serious questions to be asked about psychological motivation for the setting of this type of assignment? The ephemeral currency in which professors like Jim may be getting paid could be just ego boo or the joy of teaching, but the nature of the network has within it the potential for a more dysfunctional dynamic embodying the unconscious shadow aspects of a benign magician archetype and this needs critical self-reflection on the part of all members of the collective. It is of interest to me that I started this post talking about how DS106 elicits strong emotion for and against; defended as a bastion of creativity in education and vilified for being an elitist outfit only accessible to the few. The truth lies somewhere in the middle, but an internet gathering that has so much in common with hacker culture may not suit all. And those of us choosing to participate, may do well to remember there is an inevitable shadow side to a participatory dynamic based on strong identification with ideals or leaders. Health warning: It is not my intention to imply that anyone in the DS106 community is a hacktivist in any way shape or form, simply that the organisational structure of DS106 is similar to other open internet groups and not all have educational purposes in mind. And finally, to add some gravitas to this post, I need to mention the Mr. Men test for DS106 attendance to the open course. 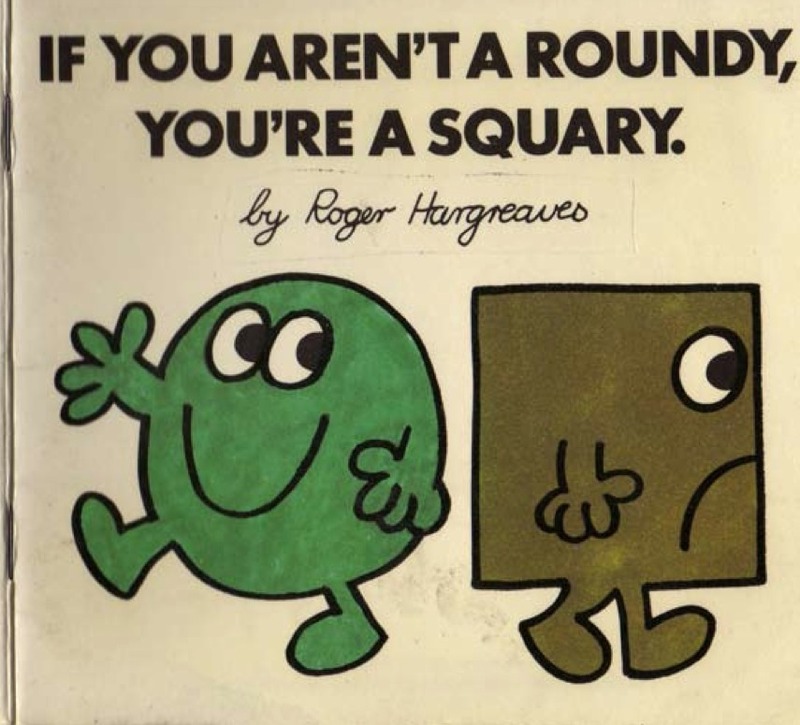 You should not do DS106 if you are a ‘squary’, but you will fit right in if you are a ’roundy’. Of course, if you want to become a roundy DS106 may just be the right place to learn. Peter, S., and Deimann, M. (2013) On the role of openness in education: A historical reconstruction. Open Praxis 5.1 (2013): 7-14. The Edge (2013) Annual question ‘ What have you changed you mind about and why?’ [online] http://www.edge.org/annual-question/what-have-you-changed-your-mind-about-why Accessed August 07, 2013. I should say that the version of ds106 you followed, was an unusual form- the 5 week summer session is a supercompressed version of the semester course, and usually has a much smaller number of enrolled UMW students. Brennan’s article has been resounding to me, thinking of people who may not get over the perceived hurdle to take part of ds106. To some degree, I am not all that worried about the ones who stand there with arms crossed across their chest, with that “Convince me this is useful” cynical pose. I’ve seen my share of those, I am already seeing their furrowed brows in my memory. There are however, a large number of people in the middle, who have the curiosity and aptitude to look at something new and say, “hmmm. Maybe” Christina Hendricks is perfect recent example. The key ingredient for “getting” ds106 is not technical skill, not internet savvyness, it is a willingness to try something new, to step into something they have not done before. This class is not one to tweak skills you have, its to try creative acts you have never done. And the hurdle that keeps people back, is that fear of failure (perceived) in public. And that is the reason for the goofy attitude we project, to say WE ALL FAIL — and there is no deep cost of it. And this is the antithesis of how school works after kindergarten. There are low threshold entry points – just doing daily creates, or modifying/using a ds106 assignment (I have done a version of the 4 icon stories with 2nd graders- it works), or just being part of the group with audio on the radio station. Is my comparison with Friends derogatory? I guess it depends what you value and where you see the boundaries. I see Friends as light weight banter with the content mainly intended to amuse and to draw attention to the character. I accept that DS106 seems deeper than that but there is a similar ‘look at me’ feel about it. DS106ers do not study in a darkened room, they study in public – success is recognition, being liked, being quoted, being mashed. Now this all fits well with social constructivist theories of learning but is not too useful if you want to learn new facts or get up to speed on the considered wisdom on a subject. Hence, for me, the main difference between conventional courses/xMOOCs and cMOOCs like DS106 is that the former share existing representations of understanding whereas the latter propose new ones. So I see them as sequential, you do your apprenticeship at college or on xMOOCs then graduate to cMOOCs when you have something new to say. I am not sure however that there is any quality control on whether that ‘something new’ means anything apart from its traction in the network. So reputation = being liked and quoted which brings us back to Friends. Thank so much, Guy. I am so glad you took the time to read and comment. I was hoping to improve the text with people’s comments and this starts the dialogue off. Where our views are similar is in that there are differences in learners and what suits a learner at a particular stage in their development may be unsuitable at another. Your idea of a sequence of suitability is also similar to Kennan’s notion that in a cMOOC no one can hear you scream (hence one needs a level of expertise that is not needed in more structured learning designs) or Siemens original criteria for MOOCs – there are criteria of suitability (limitations as well as strengths) in any learning design. As Sherry Turkle say in ‘Alone Together’ when talking about the dangers of techno-positivism ‘rapture is costly; it usually means you are overlooking consequences’. It is the exploration of consequences that interests me – something may be good, as indeed I believe DS106 to be, and it will also have limitations and not be suitable for all. This is why assessing the type of learner that suits different learning experiences and making that as clear as possible upfront can be a useful activity. I hope this post may help potential Ds106 students make a more informed choice about its suitability to their needs. And may be your distinctions will help them further. Let’s keep the conversation going! Your perspective looking into ds106 Guy is helpful, because like many complex systems in the world, it is nearly impossible to take in all the aspects. And the reputation aspect is what you might get if you view the social media conversations about ds106. I would counter the suggested goal of a course being fact/wisdom accumulation – our students are learning to expand their modes and abilities in communication, collaboration, investigating through direct experience (not lecture) issues of identity, copyright, what is creativity, what are elements of design that work, how can ideas be represented in different formats. Having taught ds106 in person and online 4 different semesters, I can tell you that this reputation aspect is far from the motivation or drive of my registered students. Yes, there was the grade, but for them they were learning new creative skills and an ability to shape their own online space- the bigger reward was expanding their communication skills, not just technical ones.